Staffed by people who fish! What Do I Need To Go Fishing In New Jersey? 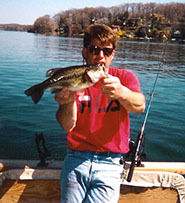 Anyone age 16 and older must have a valid license (see Exceptions) to fish the fresh waters of New Jersey with hand line, rod and line, or longbow and arrow. This includes privately owned lakes and other waters. Fishing licenses must be worn in a conspicuous place on the outer clothing while engaged in fishing, and must be exhibited to law enforcement personnel on request. It is unlawful for any person to obtain a resident license unless they have actually lived in New Jersey for six months immediately prior to the time of application. Any person who has lived in New Jersey less than six months prior to the time of application. A person who is on active duty in the armed services of the United States is entitled to fish with a resident license. No person between the ages of 16 and 69 shall take, attempt to take, or kill trout without a valid fishing license with a trout stamp attached. Veterans with a Service-connected Disability - Resident NJ veterans with a service-connected disability are eligible for free licenses which can be obtained at selected division offices and through the mail from the State.. Fishing on a Farm - Farmers and family members that live on a farm do not need a license to fish on their farm, but must obey the fishing regulations. Residents afflicted with total blindness may obtain a free fishing license from the Division of Fish and Wildlife.